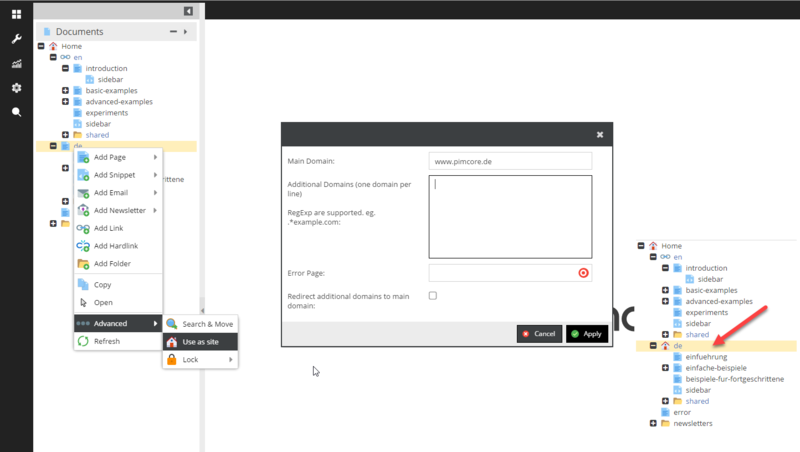 With Sites, it is possible to create multi domain web applications within Pimcore. Starting point is always a certain node in the Documents tree. From this starting point on, the whole sub tree can appear as an own Site and is reachable with a certain domain. Note: Of course, your server setup (VHost, ServerAlias) must be configured properly so that all the requests for all the domains are delegated to Pimcore. Now also the routing functionalities Custom Routes and Redirects can be configured site specific. Also, lots of other Pimcore tools and functionalities like Glossary, Tag & Snippet Management, Marketing Settings (Google Analytics, Google Search Console, Google Tag Manager) and Website Settings are site specific. See Navigation for more information.